One of the hottest trends in the creative communities online right now is hand lettering. This gorgeous take on calligraphy combines modern aesthetics with classic style to create a whole new world. I got into brush lettering earlier this year and I’m now madly in love with the hobby! It’s such an easy thing to get into with the correct supplies. Some of my very favorite gifts from when I was a kid and teenager were hobby kits and craft supplies because there’s just so much possibility. So why not give that gift to a creative in your life? 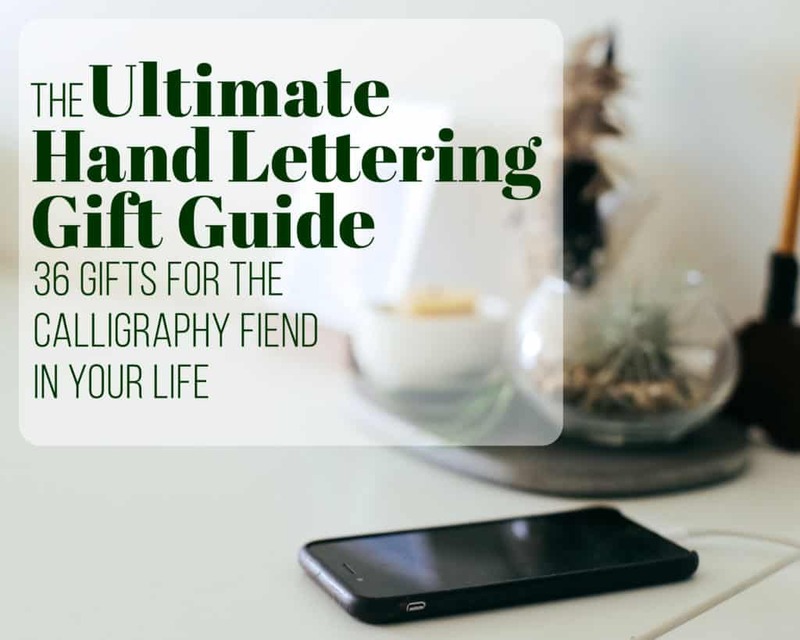 This hand lettering gift guide will walk you through the basics for a beginner set and some more advanced goodies for the intermediate calligrapher, too! These are gifts that will work for anyone who has not yet taken the plunge. The pens and materials listed here will be wonderful first steps for the hand lettering learning process. This is the perfect way to jump right in to the hand lettering hobby. This book will walk you through all the basics and help you get a grasp on the elements needed for beautiful lettering. These drill books will get you up to snuff in the art of Spencerian penmanship (aka fancy old vintage handwriting). Want to give the gift of learning? Try my Brush Lettering 101 course and see how it can help a total beginner develop their lettering skills in no time flat! Tombows are great because you can blend the colors seamlessly without ruining the lighter colors. The bright set is one of the most popular among hand lettering enthusiasts and it’s a great set for beginners. The grayscale set is great for shadows and adding that extra something to a handlettered piece. Also, it has black, which the bright set does not. If you’re gonna get your loved one a gift, might as well go big with the full set of markers! Tombows are some of the easiest markers to work with in this hand lettering gift guide, so don’t be shy about getting a lot of them! The Dual Brush Pens are excellent for medium to large work, but the Fudenosuke pens are ideal for smaller writing. This set offers both the stiff tip pen and the more flexible tip pen for a nice range of motion. This excellent brand offers a lovely sample set with multiple types of pens for hand lettering, all in black ink. These gorgeous, bold brush pens have rich colors and a wonderful feel. The size makes this pen set perfect for large projects! Similar to the set above, Micron offers an 8-piece pen set with several types of nibs. I personally prefer Micron over Faber Castell, but Faber Castell has a broader variety of pen types in its sampler set. If you want to grab brush pens in lots of colors, Micron is a great set! These pens are smaller than the Tombows, making them ideal for more precise lettering. Gelly Roll pens, particularly the metallic ones, really do write like butter. The sparkle in the ink is simply stunning, and I use these in my bullet journal all the time! These white pens are fantastic for lettering on multi-color or black paper. They’re also great for adding highlights and other accents to your hand lettering project. I use them for drawing and art all the time, too! I personally adore this pen. The Pocket Brush Pen has actual bristles to its brush, rather than a flexible nylon tip that you’ll find in most other brush pens. This is a great pen for brush letterers and artists alike, and it’s one of my personal favorites from this hand lettering gift guide. Another fantastic pen from Pentel. The Fude pen has extreme precision and you can control the amount of ink flowing to the tip. This is a great kit for any calligraphy beginner! I actually grew up using these and I loved them. The chisel tip allows you to create crisp lines and broad strokes, which is perfect for traditional calligraphy and modern lettering alike! Triplus Fineliners are staples in my stationary set. These ultra thin-tipped pens are great for detail work, and you have every color imaginable at your fingertips with this set! These bullet-tip metallic markers are simply gorgeous. 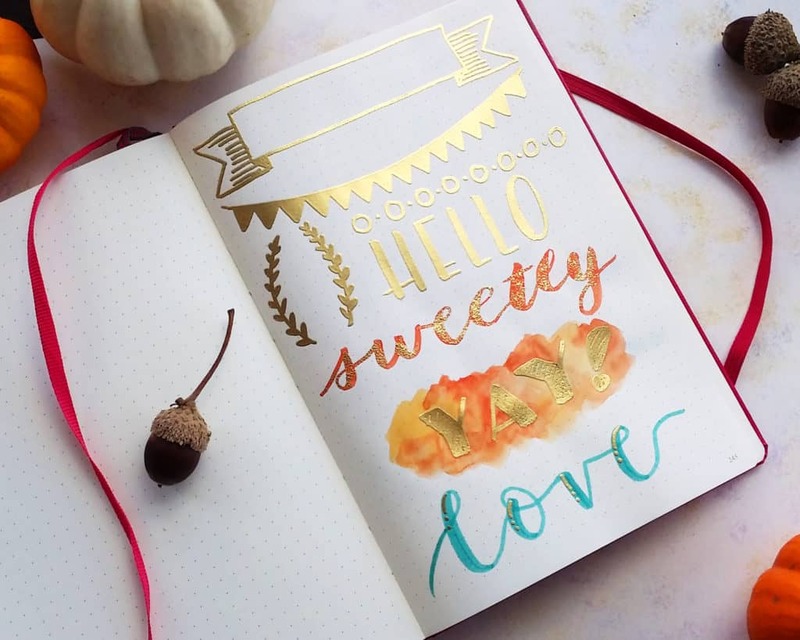 Who doesn’t want to add a pop of metallic to their hand lettered creations? Did you know Sharpie made brush pens? Neither did I until recently! But they are great pens, and giant – perfect for large projects. Watercolor is a loose medium with tons of potential. You can mix any color you want, create cool splatter effects, and make wicked gradients that you couldn’t dream of with normal brush pens. These gifts are also wonderful if your calligrapher is also into painting, because there’s no limit to the possibilities! These are some of my absolute favorites. I use them constantly. In fact, I wrote a whole post about how to use watercolors in your planner or bullet journal. But for any brush letterer or artist, I cannot recommend the Aquash water brushes enough. Concentrated watercolors in a liquid form like this are extremely easy to work with. Water it down for a softer look, mix with other watercolors, and use like an ink in dip pens – you have a ton of flexibility with this gorgeous set. If you want to have a bold, opaque white to add another layer to your beautiful work, then look no further. This white ink looks gorgeous on colored paper and black, and can be used in countless ways. I am in love with Finetecs, and I think it’s easy to see why. These paints have mica powder in them, which is commonly used in eyeshadow for a metallic or glimmery look. They apply beautifully and come in a wide variety of colors. And if you apply them to a dip pen nib, you can write with them like an ink! I use this beautiful gold set on everything I possibly can – on my bullet journal, in my artwork, and in my hand lettering. If you get this for your calligraphy fanatic, they will love you forever. Seriously, it’s one of the most gorgeous things to behold on this whole hand lettering gift guide. If you get any watercolors for your lucky loved one, don’t forget to complete the set with a plastic palette for mixing! Dip pens and fountain pens might seem intimidating, but they really aren’t difficult to use. Like I mentioned earlier, you can brush watercolor onto the tip of your dip pen and use it like an ink! And fountain pens add a touch of class and a vintage feel to whatever you are writing. I use my Pilot Metropolitan for my Morning Pages each day and I can’t go back! The Pilot Metropolitan is an excellent first fountain pen for any stationary addict. They write incredibly smoothly, feel wonderful in the hand, and are extremely well priced. The Leonardt nibs are a great beginner set for anyone wanting to dip their toes into traditional calligraphy! These nibs flex, which means you can get thick and thin strokes with a bit of pressure. This odd looking nib holder is preferred for dip calligraphy, as you can better see the thing you are writing. Gold paints are pretty, but embossing is a whole new level. This craft used to only be for professional printers and high level crafters, but it is now available at a very reasonable price. Once you have the basic materials, you can sustain this impressive looking craft for a very long time with very little new costs. And it’s super easy to use, especially in a bullet journal or planner! These embossing pens have a special ink that grabs the embossing powder and stays wet for a long time, unlike most inks. There are tons of embossing powders, but gold is a great starter powder. The effect is just too magical with gold, and who doesn’t love gold anyway? If you want something else to add to the gold powder, liquid platinum is a great choice. The color is very unique – not quite silver, not quite champagne, not quite copper… you just have to see it in the light to see the full effect! This little heat gun is what brings it all together. It melts the tiny powder particles and transforms them into the shiny, sparkly raised surface that we all love. Rhodia puts out some wonderful products that are fantastic for hand lettering. They use a dot grid, which helps the calligrapher write evenly and with proper spacing. The Rhodia is perfect for brush pens and bullet tip pens, such as: Tombow, Staedtler, Faber-Castell, Pentel, Micron, Pilot, and Gelly Roll. I would not recommend using a waterbrush or Sharpies, and I would exercise caution with wet mediums such as dip pens with ink. The thick paper of this sketchbook is fantastic for just about any media (as I’m sure you could guess from the name). I like to use mine for watercolors, Finetecs, pure inks, and permanent markers like Sharpies. The black paper in this is perfect for all the gel pens, white inks, and metallic markers listed above. This will add a whole new element to the look of a hand lettered design. Plain white paper is boring! Grab this unique toned tan sketchbook that is perfect for both rich blacks and bright white tones. So there you have it! There are enough gift ideas on this list to get your imagination turning. You can either sample from several brands and pen types or grab several items from the same brand. There are just a ton of options, so don’t worry about whether your loved one will appreciate your selection. If you are buying for a true pen addict like myself, literally everything on this hand lettering gift guide will make his or her socks roll up and down. I’ve been receiving perfectly normal plain black pens in my stocking for the last several years and I am always thrilled. So trust me, you’ll be fine. You can’t go wrong with the gift of creativity! If you’re still at a loss for what to get, make sure to check out my gift guides page for more inspiration! Oh, and if you don’t have Amazon Prime right now, you really should try the 30 day free trial (or SIX MONTH free trial if you are a student!!!!). You don’t know peace of mind until you have free two days shipping on just about everything. And the commercial free stations from Prime Music is a pretty sweet gift in itself! So go try it for a month (or six) and tell me it’s not the coolest. I dare you. P.S. If you want to put the new pens to good use, sign up to the Fox Den Resource Library here or in the sidebar to get access to lettering worksheets!